Habanos S.A. is pleased to introduce its first product exclusively made for the Travel Retail and Duty Free channel: The Montecristo Travel Humidor. 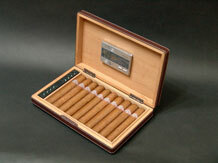 This humidor was especially designed for those Habanos lovers on-the-go. Easy to carry, to keep and to use. Comprising 10 Edmundos (52 ring gauge and 135 mm long) from Montecristo, the best known and probably the most appreciated brand of Habanos throughout the world. The name comes from the hero of Alexandre Dumas’ famous novel ‘The Count of Montecristo’, which was a firm favourite amongst the cigar rollers at the factory where it was founded in 1935. 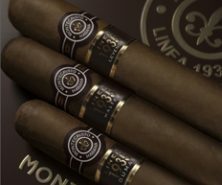 Montecristo’s perfectly balanced blend is created exclusively with selected leaves from the Vuelta Abajo region, home of the finest tobaccos in the world. The world launching of this vitola took place in Paris, on May 13th two years ago. It was a special night for gathering the most selected people in the Habanos world and the acceptance the Edmundo is still having among cigar smokers is a sign that we were right. Practical and simple but elegant and stylish at the same time, this humidor comes in a bag with the iron-stamped brand logo and inside a carton packaging that reproduces the colours of the brand. The Montecristo Travel Humidor is the best option for travellers who don’t want to leave their smokes at home but to keep them in perfect conditions, ready to be enjoyed anytime they please. 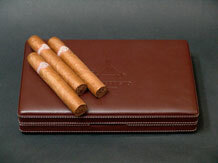 The Montecristo Travel Humidor will be available at the Duty Free and Travel Retail shops around the world. All rights reserved © Habanos S.A. • Havana City, Cuba • Site Hosted and Developed by Golden Age Ltd.